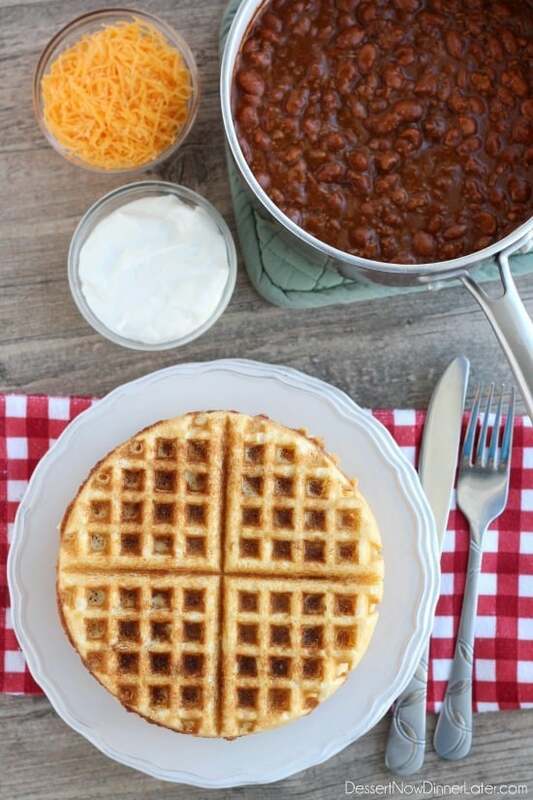 Cornbread Waffles with Chili - Dessert Now, Dinner Later! You know how cornbread and chili goes well together. Well, my friends, this has become our new favorite fall meal. 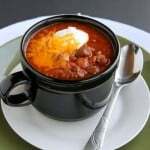 I totally cheated and used canned chili, although you can find our absolute favorite Sassy Steak Chili here on my blog. But talk about easy! 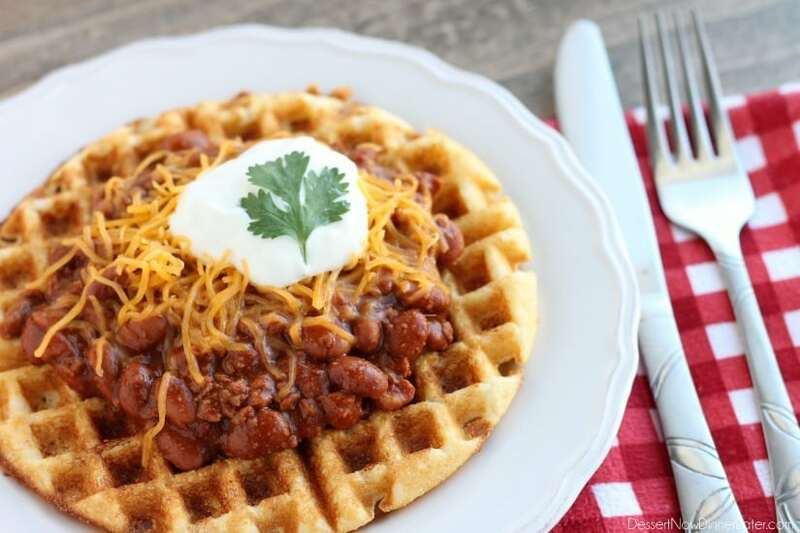 Whip up the batter, cook your waffles, and heat up your can of chili for a dinner ready in 15 minutes! These cornbread waffles are lightly sweet and crisp, yet tender. My kids were happy to eat the chili when it came with a cornbread waffle! You’re going to love this! Whisk the cornmeal, flour, baking powder, sugar, and salt in a bowl. Add the milk, egg, and melted butter. Whisk until just mixed together. Heat your waffle maker. I set mine to a 3½ out of 5. Spray your waffle maker with some baking spray. Pour enough batter to almost fill the mold (about ⅓ to ½ cup depending on the size of your waffle maker); it will puff up and spread as it's baking. Cook according to directions for waffle maker; I have to wait until the light goes from red to green on mine. These do brown quicker than regular waffles so keep an eye on them. Repeat with remaining batter; makes approximately 7 standard waffles. Keep on a plate with a towel covering the waffles to keep them warm. 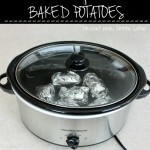 Serve with heated chili, sour cream, cheese, etc. You are food genius! I wouldn’t want to have corn bread and chili any other way. Pinned! We seriously loved these! 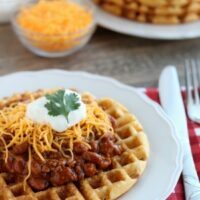 The waffles helped my kids eat the chili, so it was a win-win! Thanks for pinning! Oh my gosh this is seriously the best idea in the history of chili! 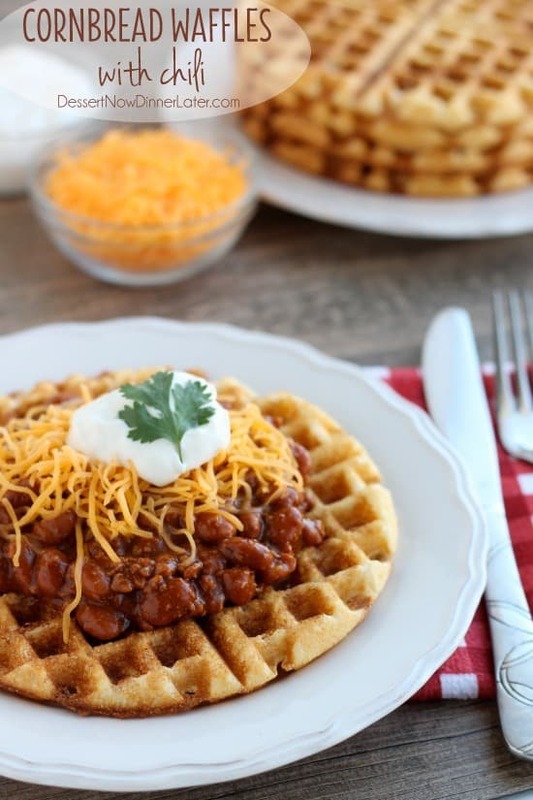 I so can’t wait to try these waffles next time I whip up a pot of chili. Pinned! I have never had cornbread waffles before! 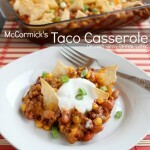 What a delicious idea.. definitely need to recreate the recipe soon. I loved the crisp of the waffles with the tender chili. It was a great combo! 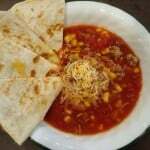 This sounds way better than the cornbread I usually make to go along with chili — I love it! Can’t wait to try this amazing combination! Cornbread and chili just go together! I hope you enjoy this twist! Cornbread waffles?! This looks DELISH! I love cornbread.. and I love chili – great way to have both at the same time! It’s like an open face sandwich, but with cornbread and chili. We loved it! This recipe didn’t work out well for me. The waffles were basically crumbly when you cut into or stick your fork in them to eat. Not sure what when wrong. Aside from that the flavour was good. I’m so sorry to hear that! If you want to try again, you can try adding an extra single egg yolk to the recipe, swap honey with the sugar, OR add a bit more melted butter for extra moisture.